My coaches, Kim and Frank, (then later) Dana and Kevin, taught me everything I know about gymnastics. I was at the gym 16 hours a week from a young age. I grew up there, so my coaches helped shape my identity as both a gymnast and human being. Coaches share their knowledge and they want you to succeed. I had to learn to listen to them. Before launching Happy Gymnastics, I didn’t to listen to...anyone really. I wanted to figure everything out on my own and told myself that no one could possibly understand the vision I had for my business. Spoiler alert! Doing everything yourself is a terrible business model. I called in some people who are like my coaches. They’ve been in startup mode before and know how to get stuff done. They know the lay of the land and are happy to show me how to build my business. Whew! Life’s a lot easier when you listen to experienced people. It doesn’t have to be anything official, but get a business coach or mentor to help you make tweaks and support you on your journey. Listen to them. They are there to help, just like at the gym. Coaches have been there before, and will help you create a path to achieve your business goals. Boom! Mental grit is born. For me, mental grit is a combination of endurance, positive self talk, focus, and drive. The same is true in business. I’ve have some bumps as I’ve launched Happy Gymnastics. It took me forever to figure out my website, content, and graphic design stuff. There were some days I wanted to shut the whole thing down and crawl under the covers. Sometimes (or lots of times…) stuff takes a left turn when you wanted it to go right. When you get redrailed, it’s your positive mental self talk, laser focus, and mental grit that help keep you on the right path. It’s always a work in progress! 3. What Others Find Scary, You Find Fun! For the ten years I competed, my father never watched me on beam. He would nervously leave the bleachers, palms sweaty, and go for a walk while I did my routine. I didn’t get it. Beam was fun! Gymnasts are delightfully weird about wanting to do things that others find crazy. We see the joy and excitement of trying something new. When I started Happy Gymnastics, some people thought I was nuts. My husband had started a business the year before and I have two young kids. For some, starting a business is scary, but for me, it’s exciting. Do your thing. People are going to think you’re a little off your rocker sometimes, but it’s important to take risks and try new stuff. Stay true to the vision you have for your business. That moment when you’re on floor, in your starting position, waiting for your music to start is the longest three seconds. My nerves would just flutter all around. But then, ZING the music would start, and I would turn on the show! I learned how to swallow those nerves and go for it. Performing is a valuable skill in business life! Having the ability to speak in front of a group counts as a performance. From clinics to congress presentations, performing in front of others helps me build my business and support others with their preschool programs. The countless routines you performed for judges means presenting in front of a large group of people is totally in your wheelhouse. When you’re feeling nervous, you can dig deep down to find that performance energy and turn it on! Time management was a skill I learned out of necessity. Just because I spent 16 hours a week at the gym, didn’t mean I could forget about all of the ‘other’ stuff. Back then it was: gym-homework-friends. Now it’s kids-husband-Happy Gymnastics (and-cooking- yoga- explaining to my two year old that no, you can’t wear your swimsuit in the snow-etc.). Bottom line: you gotta have those time management skills to make the dream work. My gym teammates were with me through tough trainings, cracked ribs (I caught the edge of the beam), gym sleepovers, sticks, flops and dance parties. It wouldn’t have been the same without those girls (and guys). Before I started my business, I met some lovely ladies at my best friend’s bachelorette party. They had their own super successful businesses! It was the first time I’d met young, cool, women business owners who were rocking and rolling. They inspired me to take my crazy online lesson plan shop idea and go for it. Shortly after that, I built my own team including: my tech guy (my husband! ), financial planner, accountant, babysitters, and mentors. All of them are the best and I couldn’t run my business without them. Having a team of support is essential when you’re running your own business. You can’t do it alone. Build a team around you that can cheer you on or challenge you when you need it. Get inspired by fellow business owners. Reach out to ask for advice and build your support network. In my early years of competing in artistic, I would often finish in fifth place. It was a bummer. I mean, it was nice to stand beside the podium, but I wanted to stand on it. It taught me how to lose (ok, fifth isn’t ‘losing’, but I wanted to be top three). I hugged my teammates and congratulated them on their wins with genuine happiness for them. I learned how to be gentle with myself if I didn’t score as high as I hoped to. Losing graciously is an important skill. As I advanced in my gymnastics career, I began to improve and got on that podium. It was sweeter because I knew what it felt like to be on the bottom. Losing can be motivation. When I first launched Happy Gymnastics, I wasn’t getting the sign ups I envisioned to build my email list. It was rough because I was excited to help people with their preschool gym programs but no one was visiting the website. Soon, I figured out a system that encouraged tons of people to sign up for free preschool gym tips sent to their inbox. My list and community grew. It was sweet because I knew how it felt to get zero sign ups. I knew how it felt to lose. The losses make the wins sweeter. 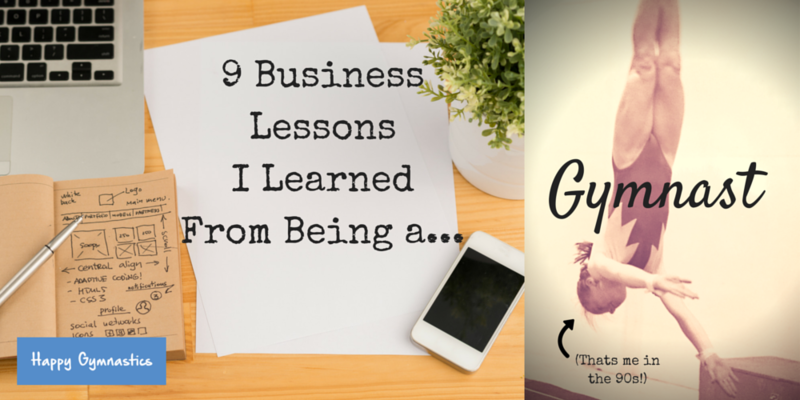 Being gentle with yourself is important in business, especially in the beginning. Everyone loses from time to time, it’s what happens after that matters most. If I had a dollar for every time I missed scoring in the top three by a few tenths, I’d be a rich woman. Every gymnast knows that every bent knee and flexed toe means tenths off your score. “Sarah” my coaches would say, “you’re just giving it away!” They were right, details mattered. Details can be the difference between first and fifth place (trust me, I know). The thing about details is..they aren’t that fun. Swinging giants on bars? Fun! Pointing your toes while doing giants on bars? Not as fun. Details matter even more in business. Happy Gym lesson plans wouldn’t be successful if I slapped them together using glue and pencil drawings. Instead, I take time with excruciating details, like full-color photography and instructions for all age groups, to make them as beautiful and creative as possible for my customers. You want to win in business? Point your toes! Take the time to get the details right. Your customers deserve your best. The details can make or break your product or service. Every so often, it was nice to show-off for people who didn’t know much about gymnastics. “WOW”, they’d say, “she just did a cartwheel!” Pretty standard stuff for gymnasts, but impressive for the typical person. Cartwheels are still impressive in business. And figurative cartwheels like providing the best customer service, gorgeous lesson plans, and fresh ideas to give people as much value as possible for their gym. Go ahead, show off your cartwheels (you know you want to!) Lean in to your experiences in the gym, they are impressive. Being a former gymnast makes you unique and people will love hearing about it! It will make you and your business stand out from the competition. Even if I’m not wearing a crushed velvet leo and slicked back ponytail (I told you I competed in the late 80s- early 90s, right? ), my time in the gym still influences my journey building Happy Gymnastics. To my fellow former gymnast turned entrepreneurs, I salute (ha!) you. Use what you learned in the gym to enhance your business. Get a coach, build that team, work that mental grit and turn on the show. And for goodness sake, stick your landing! What do you think? Did I miss something? Leave a comment below to let me know how the gym prepared you for business! Click here to check out the Happy Gymnastics Shop for funky fresh preschool lesson plans!